NOTE: A more recent (2012) SCI Forum presentation on this subject can be found by clicking here. 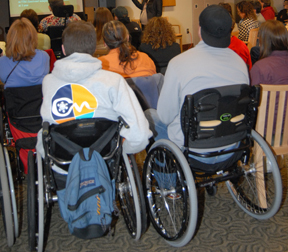 Presented on October 9, 2007, by Jelena Svircev, MD, assistant professor in the Department of Rehabilitation Medicine at the University of Washington. Read the report or watch the video from this page. Presentation time 42 minutes. After watching the video, please complete our two-minute survey. Osteoporosis, or porous bone, is a disease in which the bones lose density, become weak and brittle, and are more likely to break. People often think of bone as a static structure, or something dry and non-living. It's actually a very dynamic organ, constantly resorbing, developing and recreating new bone tissue. In osteoporosis, there is an imbalance between bone formation and bone resorption, leading to thinner, more fragile bones that can fracture easily. A little background in bony anatomy is helpful for understanding osteoporosis and risk of fractures in SCI. Long bones are made up of three primary areas (see illustration). Diaphysis, or midshaft of the bone. Epiphysis, or ends of the bone. Proximal (the end of the bone that is closest to the head of the body). 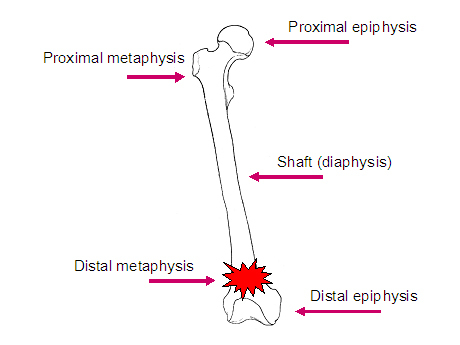 Distal (the end of the bone that is farthest from the head of the body). Metaphysis, which lies next to the epiphysis. When individuals with SCI sustain fractures, they typically occur in particular areas of the bones, often in the metaphysis or the distal epiphysis. Bone itself has a number of different components. Cortical bone, or compact bone, is highly organized and makes up about 80% of bone in the body. Trabecular bone, known as cancellous or spongy bone, makes up approximately 20% of all bone. Trabecular bone has very high bone turnover, meaning it is formed and resorbed at a higher rate than other bone. Both types of bone become more porous and brittle as osteoporosis develops. On the left [in the illustration above] is normal bone structure with a very intricate bony microarchitecture. As we move to the right we see that this microarchitecture has been destroyed, leading to a weaker bone. Normal bone structure is defined as the peak bone mineral density achieved at about 20 years of age, but this varies by ethnicity and gender. Comparing bone density to this standard tells us whether a person has osteoporosis, and if so, how severe it is. Osteoporosis is a common consequence of SCI. While the most common pattern of osteoporosis in the general population is in the post-menopausal female, who classically fractures in the vertebrae, the hips and the wrist, osteoporosis in SCI is quite different. Bone loss occurs below the level of the spinal cord injury, with preservation of bone mass above the level of the injury. Trabecular bone is more affected than cortical bone, and in particular trabecular bone of the distal (closer to the bottom end) femur (the thigh bone) and the proximal (closer to the top end) tibia (the shin bone). Studies vary, but generally there is about 30% to 40% decrease in bone density in the legs after SCI. Osteoporosis can be detected on x-ray as early as six weeks after injury. Most researchers feel that bone loss slows down and levels out around two years after injury, but some studies suggest bone loss continues to occur after that at a very slow rate. This issue remains controversial. The lumbar spine maintains normal or higher values of bone mineral density after SCI. Why does this occur? One theory suggests that the substantial weight-loading that comes from sitting in a wheelchair may stimulate bone building activity enough to maintain the bone mineral density in the spine. The non-weight bearing lower extremities don't have this stimulation and therefore lose bone mineral density. 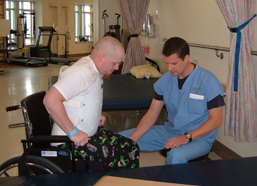 Individuals with tetraplegia have more bone loss because there's more area below the level of injury to be lost. 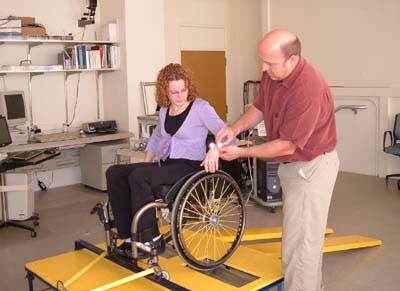 Individuals with paraplegia usually have bone mineral density preserved in their upper extremities. In the bone that is affected, the severity of bone loss is the same both in paraplegia and tetraplegia. Extent of injury: Individuals with complete injuries have more bone loss than those with incomplete injuries. Spasticity may play a role in maintaining bone mass after SCI, due to muscle pulling on the bone, similar to the effect of weight-bearing. Duration of injury: The longer time since injury, the greater the bone loss is likely to be. Aging: People in the general population usually have some degree of bone mass loss as they age. But studies in the SCI population are quite controversial. Two studies comparing older and younger individuals with SCI found greater bone loss in the older groups (Kiratli 2000, Garland 2001), but others found that it was duration since injury rather that age that influenced the bone mass. As the bone mineral density decreases, the risk of fractures increases. The incidence of fractures of the lower limbs in SCI is high, from 1% to 34% of the SCI population. Most fractures occur not from injury, but from normal activities such as transferring. Sometimes people cannot recall any sort of incident, but just notice a symptom such as swelling that, upon examination, turns out to be due to fracture. Disuse: lack of mechanical loading on the bone inhibits stimulation of bone-building cells. Disordered vasoregulation: sluggish blood flow to limbs may contribute to a decrease in bone mass. Poor nutritional status: inadequate consumption of a healthy, well balanced diet. Hormonal alterations (PTH, glucocorticoids, calcitonin): proteins in the body play a role in the maintenance of bony formation and resorption. Metabolic disturbances (tissue acidosis, alkaline phosphatase, hypercalcemia/hyercalciuria, hydroxyproline excretion): disturbance in metabolites and acidity of the blood can influence the balance of bony formation and resorption. Autonomic disregulation: impaired control by the self-regulating nervous system can lead to increased imbalance between bone formation and resorption. Historically, we tended to favor conservative or non surgical treatment. More recently, some studies are suggesting that perhaps surgical treatments may be superior to conservative treatment in the treatment of fractures. The chart above outlines the advantages and disadvantages of both. First and foremost we want to heal the fracture with minimal risk of complication and generally recommend avoiding surgical intervention. We prefer to use soft removable splints, since a plaster cast does not allow you to check the skin underneath for possible rubbing wounds that can’t be felt. It is important to immobilize the fractured area as soon as possible. In the past, practitioners didn’t think it mattered whether a limb was shortened or deformed after healing in a person who did not ambulate. We no longer think this is acceptable. We need to assess all equipment and activities of daily living during healing and post healing. If a leg ends up in the wrong position as a result of surgery or inadequate follow-up, it may be in an altered position that causes increased pressure when sitting in the wheelchair. Our goal is to maintain pre-fracture functional status; we don't want someone to lose functional independence as a result of their fracture. Calcitonin, a hormone, may prevent early bone resorption, but there's very limited research to support this. Calcium levels have been found to be normal in chronic SCI, so we don't generally recommend extra calcium intake in order to prevent osteoporosis unless someone is getting insufficient levels of calcium in their diet. Vitamin D supplementation or parathyroid hormone supplementation. Research results have been inconsistent. Some suggest that both of these substances are depressed in SCI and need supplementation, whereas others found that parathyroid hormone is normal and that vitamin D levels are elevated, in which case we shouldn't supplement. Bisphosphonates (etidronate, tiludronate, alendronate) are medications that strongly inhibit bone resorption, but again studies are inconclusive and didn't include large enough populations of people, so we cannot recommend their use in SCI. Unfortunately, no functional exercise has been consistently demonstrated to be effective in preventing or treating osteoporosis in SCI. Both standing and Functional Electrical Stimulation (FES) with cycle ergometry have been studied, but results so far haven’t shown significant benefit. These activities do have other benefits, however. Standing, for example, can reduce spasticity, improve range of motion and circulation, and provide psychological improvements. I always recommend that my patients return to as much activity and as large a variety of activity as possible, as long as they do not increase the risk for fractures. What can we recommend for osteoporosis at this time? Consume a healthy diet, including 1000 to 1500 mg of calcium. Some people suggest that vitamin D supplementation should be considered for those individuals who live in the Pacific Northwest and may not get enough sun (a natural source of vitamin D) over the winter months. The recommended dose is generally 400 to 800 IU. Smoking, alcohol and caffeine contribute to osteoporosis. Individuals should quit smoking and try to limit their alcohol (to one or two drinks per day) and caffeine intake. Avoid falls and situations that may increase the risk of fracture. This includes making sure that your equipment is safe, practicing good transfer technique, and keeping the environment safe. If you walk, remove throw rugs and other obstacles that may increase your chances of falling. I am of the belief that it won't be one thing that will prevent or cure osteoporosis in SCI, but a combination of factors, such as medications along with some other modality or exercise. Overall, as always in SCI, there are many avenues of research that need to be explored. Garland DE, Adkins RH, Steward CA, Ashford R, Vigil D. J Bone Joint Surg Am. 2001;83:1195-1200. Kiratli JB. Immobilization Osteopenia. Osteoporosis, Second Edition, Volume 2. 2001 Academic Press.207-227. Sabo D, Blaich S, Wenz W, Hohmann M, Loew M, Gerner HJ. Osteoporosis in patients with paralysis after spinal cord injury: A cross sectional study in 46 male patients with dual-energy x-ray absorptiometry. Arch Orthop Trauma Surg. 2001;121:75-78. Szollar SM, Martin EM, Sartoris DJ, Parthemore JG, Deftos LJ. Bone mineral density and indexes of bone metabolism in SCI.Am J Phys Med Rehabil. 1998 Jan-Feb;77(1):28-35. Osteoporosis and bone physiology: http://courses.washington.edu/bonephys/. Educational site for physicians and patients, run by Susan Ott, MD, Associate Professor, Department of Medicine, University of Washington.